Please refer to this page for any information or questions you might have following your procedure. Thermal sensitivity either cold and/or hot. This is not of much concern if the sensitivity only last for a few seconds. Biting sensitivity. The most common cause of this is when the bite is a bit high. Sometimes it can be hard to duplicate the correct bite when you are still frozen. Prolonged thermal sensitivity and/or throbbing pain. This may be a sign that the insult to the nerve was more than it could endure. After a procedure, if you feel that the bite is not correct, we ask that you let us know within a week. If you ignore this sign, then you risk further trauma to your tooth as well as possible fracture of the new restoration. Following your root canal procedure, you should expect all thermal sensitivity for that tooth to disappear. For 95% of all root canal treated teeth, all symptoms should begin to disappear and subside within three days. 5% of root canal treated teeth will show postoperative sensitivity resulting in pain on biting as well as possible swelling. This may occur even in the event that the root canal procedure was entirely successful. We recommend you take a basic anti-inflammatory agent (we recommend advil/ibuprofin; 400mg every six hours) for up to two days, in order to greatly reduce postoperative discomfort. In the event that you are experiencing rapidly progressing pain and swelling after a root canal procedure, we recommend that you call your dentist as soon as possible. It is very likely that antibiotic therapy will be required at this point. Please have the phone number of your local pharmacy handy as the dentist will need this in order to phone in your prescription. Also, in the event that your call is after hours and your dentist is away from the office, please remind the dentist if you have any antibiotic allergies. Usually, the pharmacist will have this information on hand anyways. It is important to note, that root canal treatment has a 98% success rate on the first treatment. Approximately 0.5% of root canal treated teeth will require extraction at some point. This is an inescapable statistic as with all other medical treatments. Avoid and sucking or spitting actions as the negative pressure can dislodge the newly formed clot. This is usually critical for the first three days. Avoid carbonated drinks. Again, this is most useful for the first three to four days. Listen to your body. Avoid the site as long as it is uncomfortable. Clean the area by brushing the extraction site. As soon as you can, please remove all plaque and debris from the extraction site. In the event that you experience discomfort, prolonged bleeding or swelling, it is important that you call our office (604.431.0431) as soon as possible. Brushing your teeth after meals and between-meal snacks not only gets rid of the food particles that you can see, it removes plaque from your teeth. Using a fluoride toothpaste is important because the fluoride can help kill bacteria, as well as make your teeth stronger. Ask us to recommend the best toothbrush for you. Generally, a brush with soft, end-rounded or polished bristles is less likely to injure gum tissue. The size and shape of the brush should allow you to reach every tooth. Children may need smaller brushes than those designed for adults. Remember: worn-out toothbrushes can not properly clean your teeth and may injure your gums. Toothbrushes should be replaced every three or four months. Flossing removes plaque and food particles from between teeth and under the gumline, areas your toothbrush can not reach. Because tooth decay and periodontal disease often start in these areas, it is important to clean them thoroughly on a daily basis. Flossing is a skill that needs to be learned. Do not be discouraged if you find it difficult at first. With practice, you will find that flossing takes only a few minutes of your time each day. What about mouthrinses and mouthwashes? If used as directed, in addition to brushing and flossing, mouthrinses and mouthwashes can help to prevent tooth decay. Traditionally, hygiene treatment has taken the form of a cleaning visit approximately every 6 months. However, in the light of new research, we now know that we need to devote more time to improved hygiene procedures. Gum disease is the most common cause of adult tooth loss around the world today. It often starts without symptoms or awareness, and is caused by infectious bacteria which multiply when your resistance is lowered for whatever reason. New research allows us to control these bacteria. This will enable us to see, at each visit, whether your gum condition is improving, deteriorating, or remaining the same. Number of appointments – we will need to see you for as many appointments as are necessary for you to achieve and maintain a plaque score below 10%. For most patients’ this will mean probably two appointments in the first instance; if the gum condition is more destructive then up to five or more appointments may be necessary. The first step in treating your mouth will be to teach you to understand your bacteria, so you can begin to realize why you are like you are, in spite of whatever efforts you have been making. We shall also teach you how to control your disease once a day through disruption of these bacteria. Together with our team member you will co-discover why you have some areas of bacterial infection and how to deal with these so that your mouth remains healthy. The hygienist will carefully clean and polish every surface of every tooth so that the bacteria can be kept under control. Some bacteria always live normally in your mouth, and it is a matter of keeping these bacteria under control. Whether you do so is entirely up to you. Immediately call your dentist for an emergency appointment. Attempt to find the tooth. Gently rinse, but do not scrub the tooth to remove dirt or debris. Place the clean tooth in your mouth between the cheek and gum. Get to the dentist as soon as possible. If it is within a half hour of the injury, it may be possible to re-implant the tooth. If it is not possible to store the tooth in the mouth of the injured person, (e.g., young child) wrap the tooth in a clean cloth or gauze and immerse in milk. If the tooth is pushed out of place (inward or outward), it should be repositioned to its normal alignment with very light finger pressure. Do not force the tooth into the socket. Hold the tooth in place with a moist tissue or gauze. Again, it is vital that the injured individual be seen by a dentist within 30 minutes. How a fractured tooth is treated will depend on how badly it is broken. Regardless of the damage, treatment should always be determined by a dentist. Moderate fractures include damage to the enamel, dentin and/or pulp. If the pulp is not permanently damaged, the tooth may be restored with a full permanent crown. If pulpal damage does occur further dental treatment will be required. Injuries to the inside of the mouth include tears, puncture wounds and lacerations to the cheek, lips or tongue. The wound should be cleaned right away and the injured person taken to the emergency room for the necessary suturing and wound repair. Bleeding from a tongue laceration can be reduced by pulling the tongue forward and using gauze to place pressure on the wound area. Outside the Clinic’s normal working hours, we have a messaging service to contact our Clinical Staff. Patients who require emergency dental treatment due to severe pain, persistent bleeding following an extraction, or for suturing of lip or oral lacerations following an accident should telephone Crystal Dental Centre. A bridge is a way of replacing a missing tooth, unlike a denture it cannot be removed for cleaning. It allows us to fill in the space. To use it, however, we must “file” down the teeth on each side to let it hold on to something. The extra tooth connects to both of the filed down teeth. We use a cement to hold it in place and create a good seal. Bridges are more often than not tooth coloured, a “porcelain” is baked onto a precious metal sub structure. A model is made by pouring plaster of Paris into an impression of the patient’s mouth, it helps the dentist decide how to plan the patient’s treatment. They are referred to as “study” models or dental “casts”. Orthodontics is that aspect of Dentistry involved in monitoring and correcting the position of the teeth and jaws. Treatment will involve fixed or removable braces. Fillings are traditionally made out of metal. We call it amalgam, a mixture of silver, copper, mercury and various other metals. We remove the decay from the tooth, then create a way that the tooth can physically hold the filling in place. We then restore it with amalgam, which starts out moldable and becomes very hard in a matter of minutes! Controversy surrounds the use of amalgam since it contains mercury, however, studies that hold scientific repute fail to support the claims that amalgam is harmful. White fillings, or composites, are used in some cases. They look much better and do not contain any mercury. However, to date they are much less durable, especially on your back (or posterior) teeth and are prone to recurring decay. Technology continues to press forward and they someday may be as strong as amalgams! Root canal treatment , or Enodontics, is often a pain-free procedure. We carry out root canal treatment to remove either a diseased or necrotic (dead) pulp out of the tooth’s root, allowing a tooth to be saved which otherwise might have been extracted. The pulp is the conglomeration of nerves and capillaries in the tooth. To do this we must get to the pulp by making a hole in the top of the tooth. This way we can use our instruments to clean out the tooth’s sick inside. We then fill it with a material called gutta-percha which helps seal off the canal. The tooth can then be restored with a filling or a crown depending on the situation. In situations where teeth are missing we can also use a Removable Partial Denture. This appliance is not as involved as a bridge and does not require any drilling. It is usually used when the space without teeth is too large for other treatments. The “partial” as they are called, locks into place sometimes with its metal clasps. It has an acrylic or chrome cobalt backbone. The teeth are the same kind used in full dentures. What is a Crown ? Crown treatment is a long-term method of replacing missing teeth. A crown is placed over an individual tooth, (somewhat like a thimble over your finger) where there is no longer sufficient tooth structure left to place a filling. The crown can either be tooth coloured or be made of “White” or “yellow” gold. A full (or complete) denture is where there are no natural teeth left and so the denture has a full set of teeth. What do Panoramic x-rays look like? 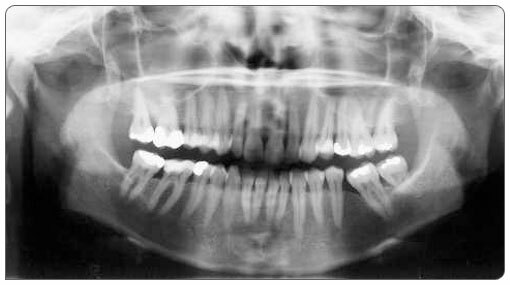 This type of x-ray is also called an OPG OPT or DPT. The machine spins around your head to get the “big picture.” Dentists use this radiograph (as we call it) for several things. They are excellent for taking teeth out and for preliminary diagnosis of many conditions. We can use them to get a good overview of the amount of bone support your teeth have. We can evaluate the sinuses and screen for a variety of pathological conditions that can occur in both the upper and lower jaws. Panoramic radiograph of jaws and teeth. Healthy dentition with many filled teeth; three wisdom teeth and one molar tooth in the left lower jaw (d 36) have been extracted. Maxillary sinuses and temporomandibular joints are also visible. What is a periapical x-ray ? This type of x-ray is the size of a postage stamp and is used for diagnosing specific conditions on or around a tooth such as cavities or bone loss caused by periodontal disease. With these we can often also see bone loss caused by a sickness within the tooth. Existing dental work can also be evaluated. Also known as a mouthguard this is a piece of plastic that protects the jaw from external injuries. See your Hygienist at regular recall intervals as advised. This is the key to a Healthy Mouth. Daily Flossing & Brushing, at least twice a day, before or after mealtimes, as advised. Use a rotary toothbrush, like the SoniCare or the Braun. Use a Fluoride gel or Fluoride Mouthwash. Keep up your Preventive Care at home. Use recommended aids. Avoid misusing your teeth, like stripping cables, or biting your nails. Protect your teeth. Get a Mouthguard if you play sports. Please get Dental Problems attended to early. Don’t leave them to later. Maintain your investment in your mouth! Don’t waste your time and money. Attend your Dentists Recall Examination when advised.